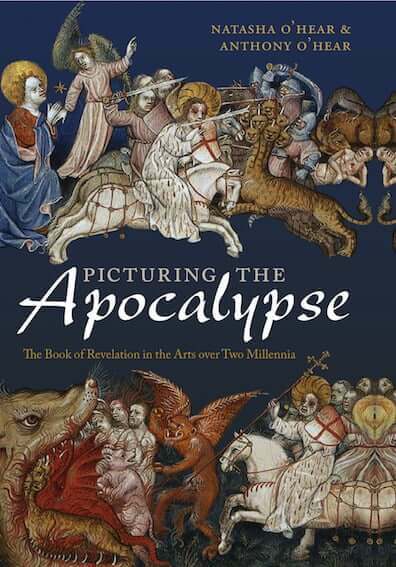 Natasha O’Hear & Anthony O’Hear, Picturing the Apocalypse: The Book of Revelation in the Arts over Two Millennia (Oxford: Oxford University Press, 2015). 368 pp. ISBN: 978-0-19-968901-9. This book fills these gaps in a striking and original way by means of ten concise thematic chapters which explain the origins of these concepts from the book of Revelation in an accessible way. These explanations are augmented and developed via a carefully selected sample of the ways in which the concepts have been treated by artists through the centuries. The 120 visual examples are drawn from a wide range of time periods and media including the ninth-century Trier Apocalypse, thirteenth-century Anglo-Norman Apocalypse Manuscripts such as the Lambeth and Trinity Apocalypses, the fourteenth-century Angers Apocalypse Tapestry, fifteenth-century Apocalypse altarpieces by Van Eyck and Memling, Dürer and Cranach’s sixteenth-century Apocalypse woodcuts, and more recently a range of works by William Blake, J.M.W. Turner, Max Beckmann, as well as film posters and film stills, cartoons, and children’s book illustrations. The final chapter demonstrates the continuing resonance of all the themes in contemporary religious, political, and popular thinking, while throughout the book a contrast will be drawn between those readers of Revelation who have seen it in terms of earthly revolutions in the here and now, and those who have adopted a more spiritual, other-worldly approach. The book received a very positive review by Professor Diarmaid MacCulloch in The Times (25 July 2015). He wrote: “Like the Book of Revelation itself, you don’t have to read this study in a linear fashion; you could pick out your favourite artist, composer or novelist from the index, and see how successive episodes of the vision have fired them.” He said it was “excellent … sharp and absorbing”, and The Spectator called it “deliciously prescient… an engrossing, delightful and ultimately uplifting read”. Read more on the book website. Anthony O’Hear is Professor of Philosophy at the University of Buckingham and Director of the Royal Institute of Philosophy. He has been a government advisor on education to five secretaries of state for education. He has been editor of the journal Philosophy since 1995, and is the author of many books and articles including The Great Books: From The Iliad and The Odyssey to Goethe’s Faust: A Journey Through 2,500 Years of the West’s Classic Literature (Icon Books, 2007), Plato’s Children (Gibson Square, 2005), and Philosophy in the New Century (Continuum, 2001). Natasha O’Hear specialises in artistic interpretations of the book of Revelation. She completed a PhD on the subject at Oxford University in 2008 and published Contrasting Images of the Book of Revelation in Late Medieval and Early Modern Art (OUP, 2011).